Looking for more greens and veggies in your Asian menu? 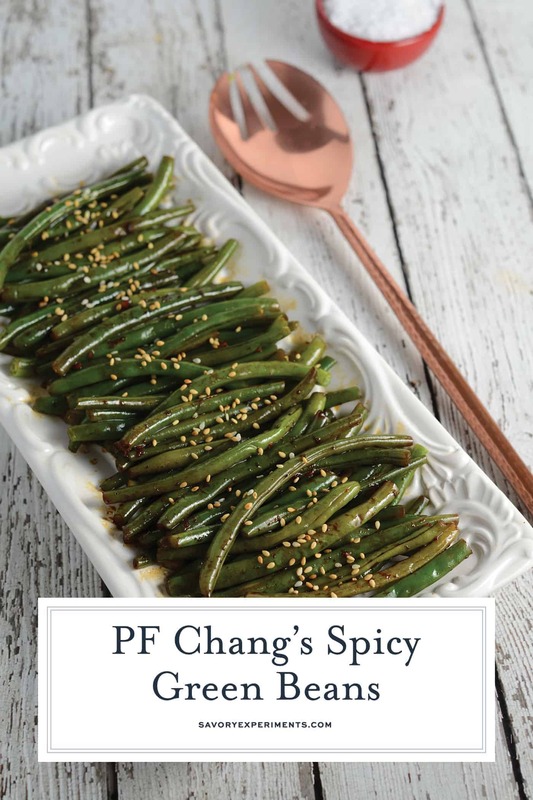 Check out my PF Chang’s Spicy Green Beans! 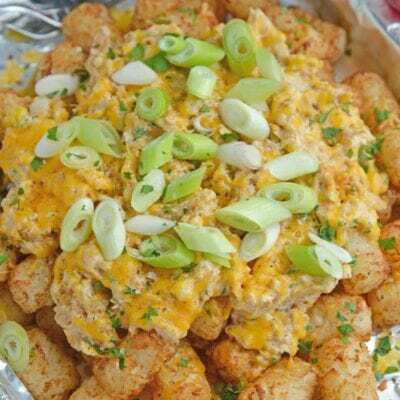 An easy, but flavorful side dish recipe. 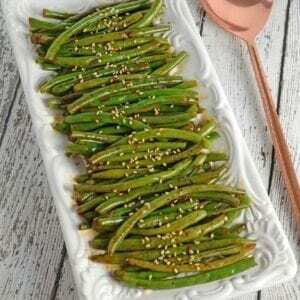 PF Chang’s Chile Garlic Green Beans are an easy and flavorful side dish recipe. 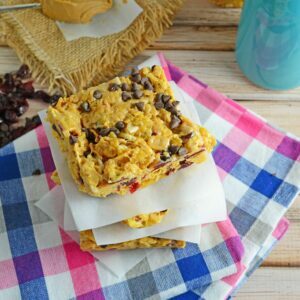 Just 6 ingredients for the best green bean recipe! I was making Pineapple Fried Rice and Yakitori Chicken the other night and realized I wanted more green on the table. 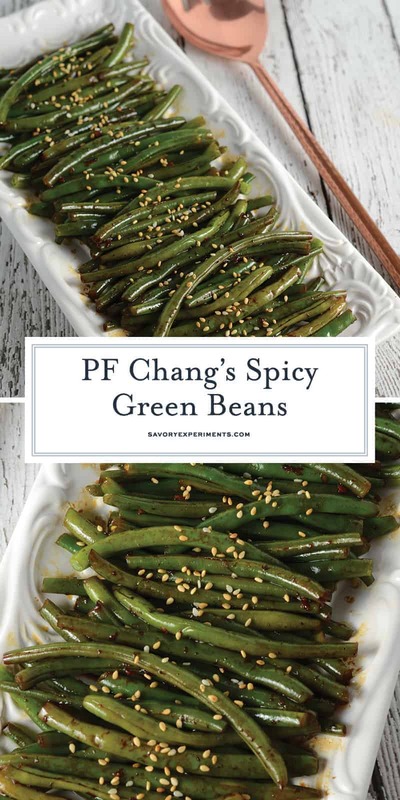 I loved the salty spicy flavor of PF Chang’s Spicy Green Beans, so I decided to give them a whirl. 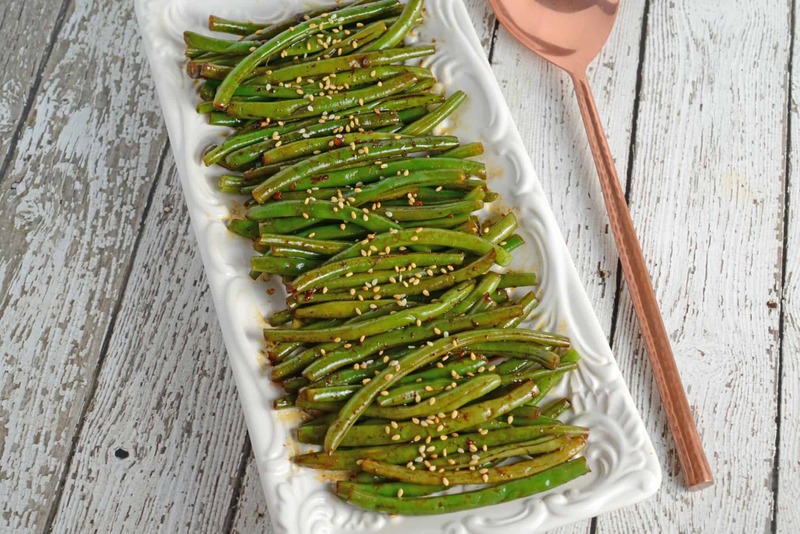 Make sure you PIN Spicy Green Beans! It took me several years to get on the PF Changs bandwagon. Living in a city with so many locally owned restaurants with AH-amazing food, chain joints aren’t nearly as accessible and I like to support local. In fact, we have one locally owned Chinese restaurant with real, authentic cuisine. The menu is even printed in Cantonese. Thankfully, one of our best friends is able to communicate (and order) for us when we go. FACT: Green beans actually grow on bushes! But one day hubby and I found ourselves out in the county at a good, old fashioned mall in the middle of a torrential downpour. We had the choice of PF Changs or Cheesecake Factory. We picked PF Changs. To both of our surprise, it was really good! Not exactly authentic Chinese food, but really solid American Chinese food. I had the Kung Pao Chicken and him the Orange Chicken. FACT: Green beans are often thought of as a vegetable, but they are actually a fruit. For sides we had these fabulous Chile Garlic Greens Beans and a Wok Seared Brussels sprouts. 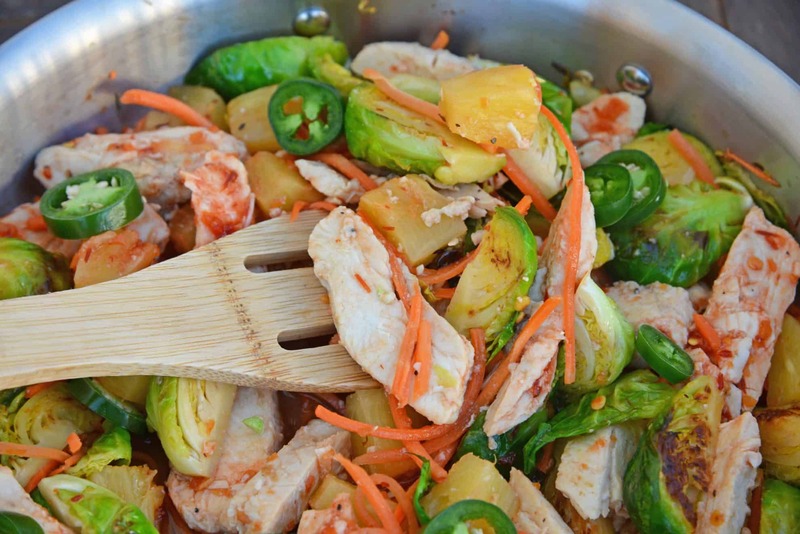 I’ve since also made a whole meal out of the fresno pepper packed brussels sprouts with my Schezwan Chicken and Sprouts. But more about this green bean recipe. 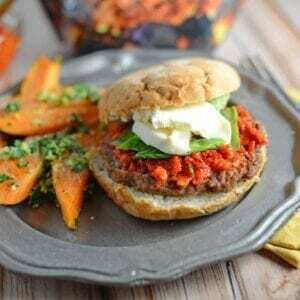 The original is made with a “fiery red chili sauce, fresh garlic and Sichuan preserves”. What in the world are sichuan preserves? Basically just a garlic chile sauce. Think spicy and red. Many of the copycat recipes use a garlic chile sauce, but I used crushed red pepper flakes to mimic the peppercorn, spicy flavor. 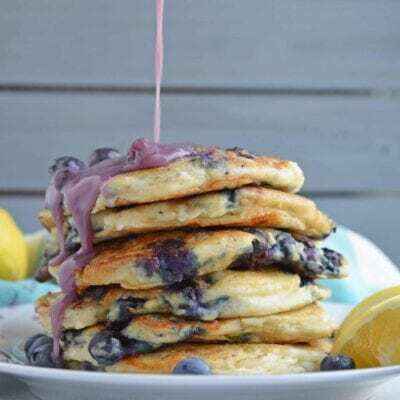 You can certainly use a chile garlic sauce or even Sriracha, if you choose. ONE. Make sure they are a vibrant green After all, these are green beans. Avoid any beans that have a yellowish or brownish tint. TWO. The surface of the green beans should be smooth and taunt, not wrinkly or slack. THREE. Have you ever seen someone snap a green bean? A nice SNAP is a sign of a ripe green bean, the only issue you that you can’t guarantee that the whole batch was harvested at the same time or even came from the same farm when at the grocery store. This technique works best at a farmer’s market when you can be more sure they are all from the same harvest. FOUR. Avoid the gianatic beans. Bigger is not better in this case. 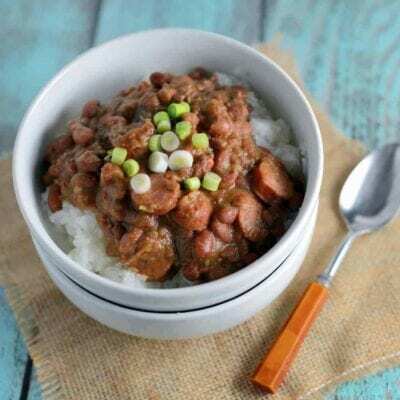 Larger beans can be harder to cook and have a stringy texture. FIVE. Store your green beans in the refrigerator and use them as soon as possible, but not longer than 3 days after purchase. Changes are they were already harvested over a week before you bought them. SIX. To prep green beans, trim any twigs or stems on the ends of your beans. PRO TIP: Fruits and vegetables begin to lose nutritional potency the moment they are picked. For the best nutritional value, shop local to ensure your produce hasn’t already endured a super long trip. In this green bean recipe, the beans are blanched to ensure they are cooked, but still have a crunchy texture. I used thin, French green beans because they were on sale, but you can use traditional, thicker versions too, just steam them for a few minutes longer. Can I use bagged green beans? You can use store bought green beans in the bag to save some time. Just beware that they might not be as fresh. Can I use frozen green beans? I am usually an advocate for frozen vegetables, as they are an excellent alternative to fresh, but for this recipe, I really suggest using fresh green beans. Can I use a different type of vegetable? Sure! In fact, PF Changs also makes a Sichuan style asparagus using a very similar sauce. 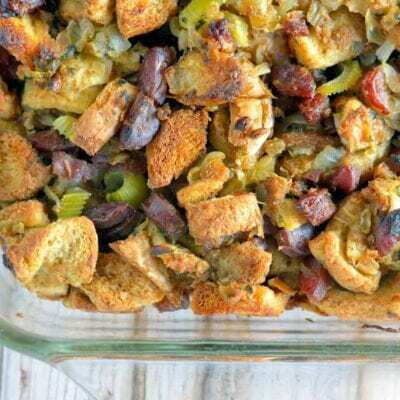 You can also use it for brussels sprouts or other vegetables. The sauce even tastes great on rice! 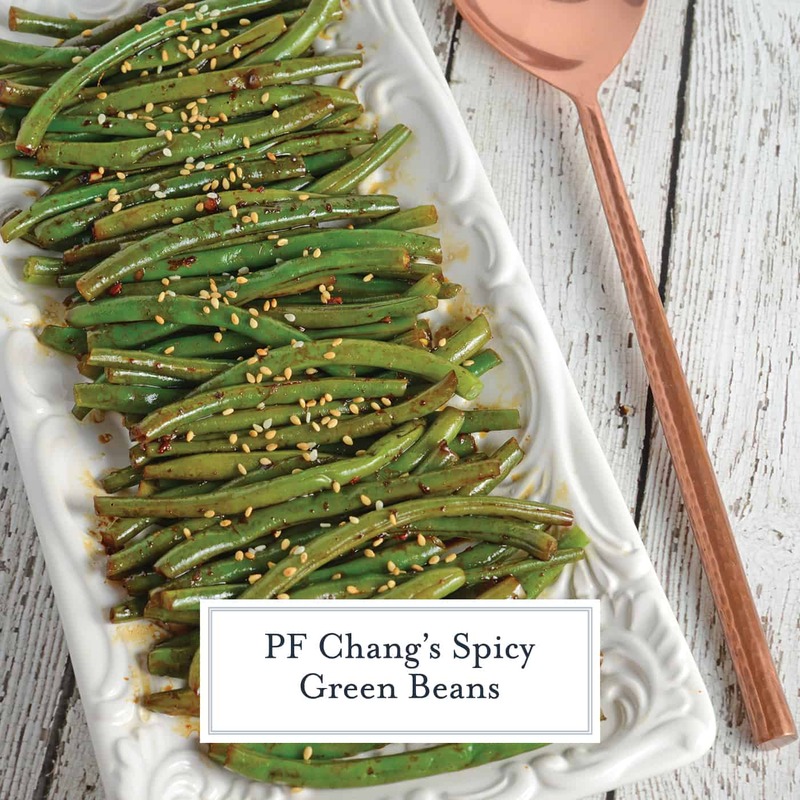 PF Chang's Spicy Green Beans are an easy and flavorful side dish recipe. Just 6 ingredients for the best green bean recipe! In a large frying pan, fill half way with water and bring to a low simmer. Add greens bean for 3-4 minutes, or until tender. Cooking times will differ depending on the size of your beans. Remove to a colander and rinse with cold water to stop to the cooking process. Drain well and set aside. Over medium-low heat, heat sauce, stirring, for about 3 minutes. Toss with greens beans. Remove to serving platter and garnish with sesame seeds, if desired.